It is very important for us that our guests feel a sense of peace and harmony during and beyond their stay at Vedanā Lagoon Resort & Spa. The ever present nature and subtle environment design is the ideal setting for a soothing and relaxing experience for both the mind and the body. We offer a daily complimentary wellness program including yoga and tai chi, a perfect way to start a gorgeous day. connecting the mind and body. In Vietnamese, the words mean cultivating(tai) energy (chi) – yet the derivation is said to be from the Chinese ‘t’ai chi ch’uan’ meaning supreme ultimate boxing. For thousands of years, the Vietnamese people have practixed tai chi for their physical & psychological wellbeing. It is a way of life bringing ourselves and the universe in total harmony. It can be practiced by virtually anyone regardless of age or health. Yoga is an integration of physical, mental and emotional exercises designed to balance and unify the mind, body, and spirit. The goal of yoga is to bring the yogini closer to the divine – to attain perfect spiritual insight and tranquility during practice. Hence, the sanskrit word yoga literally means yoke, meaning to unite or attach to the divine. Yoga strengthens, promotes flexibility, tones the body, enhances vitality, alleviates stress, cultivates balance, and calms the mind. The yoga style we teach is a Vinyasa flow from one Hatha yoga posture to another, synchronising the breath with each movement. We welcome all levels from beginner upwards. Vedanā means feeling or sensation in sanskrit. In Buddhist philosophy, an awareness and concentrated focus on Vedanā leads to enlightenment and the end of suffering. It is our intention to provide you with a memorable pleasant feeling or sensation that you take home with you, and remember forever in your heart. Vedanā Wellness & Spa brings you an experience of spa life which we define as LUSH: Luxurious, Unpretentious, Sustainable and Healthy. We use 100% natural ingredients that we carefully source, handle and blend, making sure there are no chemical or artificial components in our spa treatments. Where possible, we derive all spa products from our herb garden or locally from sustainable sources fresh from the markets in the morning. 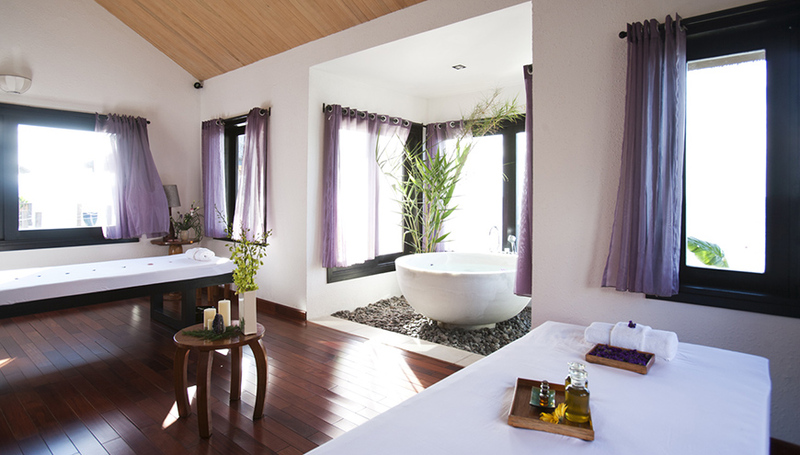 All our treatments are pure in style and substance, offering the unique flavours of Hue, Vietnam. It is our belief that everyone we encounter is a gift. We are grateful for your gift, and hope that you will receive ours of care and appreciation with our compliments. We wish you a lush Vedanā experience. Any scrub, wrap or body treatment may be swapped for another from the spa menu provided it is in the same category, price and duration. Please request at the time of booking. This traditional Vietnamese healing therapy combines gentle strokes with specific focus on pressure points. Suction cupping releases toxins and brings blood-flow to stagnant skin and muscles. Experience the ultimate in wellbeing and rejuvenation. Firm pressure is applied to the back muscles using hands, fingertips, knuckles, elbows and forearms, stimulates body tissues. It relieves pain or tension, and promotes relaxation. This releases tension in the forehead and scalp areas, stimulates mental function, promotes hair growth. using therapeutic essential oils for your individual scalp condition and hair type. It’s a great way to keep hair looking youthful and shining. It is based on the ancient art of applying pressure to different points on the feet relating to specific organs and glands in the body. It promotes improved circulation, relaxation and energy balance. These Aryuvedic head and neck techniques relieve tension headaches, eyestrain, ear problems, insomnia, neck and shoulder stiffness, hair loss, mental anxiety and fatigue. Overall, it improves concentration and generates feelings of wellbeing. All products contain 100% natural, alcohol-free active ingredients, freshly extracted aloe, and synergistic blends of therapeutic-grade essential oils. Free from petrochemicals, artificial fragrances, synthetic colourings and preservatives, and unnecessary fillers, we offer a concentrate of nature to enrich your life with the endless benefits of pure botanicals. Using a synergy of essential oils, designed to hydrate and nurture dry or mature skin, enhances skin suppleness, while promoting smoothness. Skin appears younger and more radiant. Soothing & cooling, this hydrating treatment is exactly what you’ll need after an excessive sun exposure. Fresh aloe vera, cucumber and geranium essential oil known for their skin healing properties are applied, making the treatment refreshing, repairing and healing. A hue specialty, soap berry gently cleanses and conditions hair and scalp. Soap berries have been used as ayurvedic remedies for hair, scalp, and skin conditions for thousands of years – including damaged hair, preventing hair loss, eczema, psoriasis, dandruff, preventing lice, and even for migraines. Saponin-rich soap berry relieves itching and softens the scalp. It promotes hair growth; it is moisturising, antibacterial and restorative. You’ll leave with shining hair and feeling sensational!